The market continued its indecisiveness and has chewed up anyone trying to anticipate the next big move. Don’t fall for the market’s tricks and stick to sound analysis of supply and demand. The market often convinces you that you are wrong before finally proving you right. Markets gave back a big chunk of yesterday’s relief rally. Seems a bit of the bi-polar temperament is returning to the markets, but these 1% dips and rebounds are nothing compared to what we saw just a few months back. While it feels dramatic because the markets have been so docile lately, keep everything in perspective. The market continues to be relatively calm and the sky is not falling in spite of what you see reported in the financial press. Selloff volume has been greater than rebound volume, but that is not unusual for selloffs when everyone is on edge. Stealth corrections often do more damage than ones everyone is talking about, and without a doubt this pullback is front and center. In-your-face corrections flush out the weak holders and rebound in short order. It is the stealth corrections where everyone is lulled to sleep by complacency that have the potential to put a large dent in your portfolio. All the chatter and fear in the markets today means the selling will climax and we’ll find our footing. Remember, complacency is what allows bigger corrections to happen and I don’t think the market is complacent yet. The market never wants to be easy and the long trade was getting a bit too obvious. And of course if the long trade is too obvious, then a reversal becomes the second most expected trade by the cynics. But to fool bulls and bears alike, the market throws in these whiplash head fakes to draw in both sides and then proceeds to humiliate and demoralize everyone. Only after everyone is crushed and given up will the market reveal its true intentions. There is renewed fear over Europe, yet again, but seriously, this story is three years old! These recycled headlines are not the stuff that moves the market in major ways. New and unexpected news moves markets, not something that has been over-analyzed ad nauseam. Free and efficient markets are the most effective discounter of known information ever conceived and all of this noise is already priced in. Anyone claiming what is going on in Europe, Asia, or the US is new and unexpected is deluding themselves. Who is actually surprised that young and unemployed people in Greece and Spain are pissed off? Really? Common, give me a break. So what does that mean for a trader? Market reactions to these old headlines are not going to stick. There are plenty of reasons the markets can head lower, but it won’t be any of the ones people are talking about right now. Weak holders can get shaken out because of the headlines, but that selling dries up quickly and it becomes a great buying opportunity for the bold. We will have a correction, just not yet. The nervousness is too pervasive for the market to selloff in a material way. We need more complacency before that happens. While there is still upside in this move, that doesn’t mean we have to sit through all these ulcer inducing gyrations and head fakes. It is far easier to watch volatility this from the sidelines after cashing in decent gains from the earlier, easier, and more profitable portion of this rally. Fools hold out for top dollar and only a gambler enjoys these market whips. Buy early and sell early are the only way to beat this game and sleep well at night. It is not wrong for an investor to hold for longer periods of time, but we are traders and our nimbleness is our greatest strength. It would be a shame to give up the only advantage we have in this game. The obvious short over the last couple days is putting the hurt on a lot of premature bears. The best trade is often the hardest trade. Yesterday the hardest trade was buying the market. And that turned out to be the right trade. The indexes staged a relief rally after five consecutive down-days, including the largest single decline in three months. All of Bernanke’s QE-finity gains were given back as we fell to the 1430 trading range from early September. Yesterday’s price action was a healthy pause to let investors regroup and make intelligent, rational, and informed portfolio decisions, as opposed to Monday’s crashing market that took out countless autopilot stop-losses on the way down. No doubt a lot of today’s strength is aggressive shorts getting blown out of the water, yet again. The time when the market sells off and the shorts are afraid to touch it will signal the real deal. Each bear-trap moves us one step closer to that day. We need to get in the head of the market if we want to figure out where we are headed. Everyone who bought the Bernanke bounce was either chased out of the market or is/was underwater. The rally was fairly obvious by that point and anyone jumping on the bandwagon was late to the party. QE3 was the good news everyone was hoping for and after it was announced it finally felt safe to be into the markets, but as we witnessed, it was actually the most dangerous time to buy in the last three months. It is basic human psychology combined with supply and demand dynamics that drive this market paradox. As humans, evolution conditioned us to take emotional cues from the people around us. If other people are freaking out, then it probably means a tiger entered the camp and even if we don’t see it with our own eyes, our survival depends on following the crowd to safety. Same goes for complacency. If no one else sees anything dangerous, then it is okay for us to relax too. While this herding mentality works great in the wild, it will get your head cut off in the financial markets. Supply and demand dynamics make it such that these rules are flipped upside down. We can safely ignore what everyone is panicked about, but we have to fear what no one else sees. Financial markets move based on new buying or new selling. When the crowd thinks one-way or the other, they as the aggregate have already placed their trades and are simply waiting for other traders to come in and continue moving prices their direction. But by the time the crowd is nearly unanimous in their views and everyone feels the most safe, all the buying has already occurred and there is no new buyers left to continue the move. So just when you feel most comfortable is when the market is about to reverse on you. And of course the opposite applies, when the market feels most risky is when it is often the safest to buy. So how do we use this information? Looking in the rearview mirror it is obvious that the safety of QE-finity was a mirage. But we can’t trade last week, so we need to focus on what will happen tomorrow. These five days spooked the market pretty good and brought the fight back to demoralized bears. Riots in Greece and Spain are making everyone nervous. The market doesn’t feel safe anymore. And as it turns out, the best time to buy stocks was over the last two days when it felt like everything was falling apart. An easy way to gauge market sentiment evaluating how you feel? Does the market feel safe? Does it feel scary? Are you excited to buy the dip, or fearful of more downside? If you’re relatively normal, your feelings will mirror the majority of the market. Looking forward, the dips that scare everyone and invigorate the bears can safely be bought. The dips that bears are afraid to short and everyone else assumes are just another great buying opportunity will turn out to be the real sell off. After this week’s vicious bear-trap, a lot bears are likely to go into hibernation and that means we need to be far more careful of the next selloff. Looks like aggressive bears who shorted the market are getting squeezed out today. This bounce certainly stopped the downside momentum and put many bears on the defensive. There will be a bigger corrective wave in our future, but it usually takes a few failed attempts before one finally sticks. More psychology is involved in why this happens, but we’ll save this for another day. If you can’t wait, check out my March 13th post on the Psychology of a Top. We’ll probably top 1475 in coming weeks as calm and complacency return to the markets. You can stay long for the time being, but the more confident you are in your positions, the more seriously you need to think about selling. Obvious correction or head fake? Markets are lower, but seem to be finding a floor, preventing a wider cascade selloff. Have we triggered enough automatic stop-losses to clear the deck and resume our rally? Sticking with the trend remains the high probability trade, but the returning volatility is going to make for a bumpy ride. The selloff continues as we dipped to 1430 this morning. It’s been a while without a material selloff and the ride was getting a bit too easy for the longs. Everyone knows the market goes two-steps forward, one-step back, but each time the step-back happens, it catches everyone off guard and they panic. Every rally must come to an end, and so will this one. But the thing about trends is the high-probability trade is always sticking with the trend because it continues countless times, but reverses only once. W could be at the start of this rally’s reversal, but that doesn’t change the higher probability that this rally will continue. From a risk/reward perspective, I’ll gladly be wrong every once in a while if it means I can be right ‘countless’ times in-between. And of course timeframe is everything when talking about the direction of the market. What the market does in the next ten minutes could be different than what it does later today, this year, or the next ten years. Bears could be right over the next two days, but bulls could be right over the next two weeks. This is why it is so important to take profits when you are right because often if you wait too long, you end up becoming wrong. Europe is crying wolf again and the market is spooked by the street riots. As investors we have to ask ourselves if this unrest will affect the rate of economic recovery? This isn’t the first protest and likely won’t be the last. Ultimately this won’t have much impact, but the market is nervous and people by nature are 2.5x more risk adverse than greedy. This is why the markets selloff at the first hint of risk. The biggest headwind for US stocks right now is a strengthening dollar. Since currencies are relative, a weakening euro translates directly to a strengthening dollar. That doesn’t mean the dollar is in good shape, just that it is less bad than the euro right now. How this affects the equities markets is through a strong inverse relationship between the USD and the US markets. Just one of the many reasons explaining this correlation is a weak dollar boosts the stock prices of US companies with international exposure because it increases the relative value of their overseas sales and profits. And of course the opposite applies when the dollar increases, like we are seeing right now with the unrest in Europe. What will ultimately determine where this dip goes is if selling cascades, or if it climaxes and exhausts itself. It all depends on the resolve of the larger group of holders. Will the selloff persuade previously content longs that they need to bailout? Or will the selling pressure from nervous holders, late buyers, and early shorts fail to trigger something bigger and the market will bounce after this smaller group is done selling? It is impossible to gauge how contagious fear is in each situation, but under most instances cooler heads prevail and value buyers jump in when prices fall to attractive levels. The easy trade is coming to a close and making money is going to become more of a chore as the volatility returns. There is lots of debate whether this is just a dip or the start of a correction, but the great thing about being a trader is we can cash in our profits and let the market figure this out while we watch other bulls and bears get turned into minced meat. We don’t always need to be in the markets to make money, and in fact it is less stressful to capture profits by selling into strength and then waiting for the next great trading opportunity. Some people want to hold big winners for their entire run, but that is no longer trading, it is investing. And if you want to invest, then you need to be as thorough and disciplined as a Warren Buffet. If you want to hold a stock through good times and bad, that is like getting married and you better know your stock as well as your spouse if you want to hold through each base and correction. This includes reading annual reports, every article written about a company, talking with customers, suppliers, and anyone else who can give you an insight into the growth prospects of the company. This is far easier to do with consumer product companies like CMG, AAPL, and NFLX. If you are naturally an early adopter, look for the new companies and products you are most excited about. Find the cult following and huge growth opportunity Wall Street doesn’t know about yet. But remember, to hold through good times and bad, you are marrying the stock, so you better have a lot of conviction that a dip is just a dip and not something more. Does this mark the end of the run? S&P500 daily at end of day. Markets had their biggest down-day in several months, but don’t jump on the correction bandwagon just yet as the market hates being obvious and will most likely chew up both bull and bears with head-fakes before revealing its true intentions. The markets opened higher, but started selling off in late morning trade and the slide accelerated under 1445 by late afternoon, violating previous support at 1450. Selling or shorting today’s weakness is the obvious trade and often the obvious trade is the wrong trade. But today’s 1% decline is noteworthy because it is the largest decline in at least three months. This return of volatility could be the early signs of turmoil in the markets, which often precedes a reversal in direction. 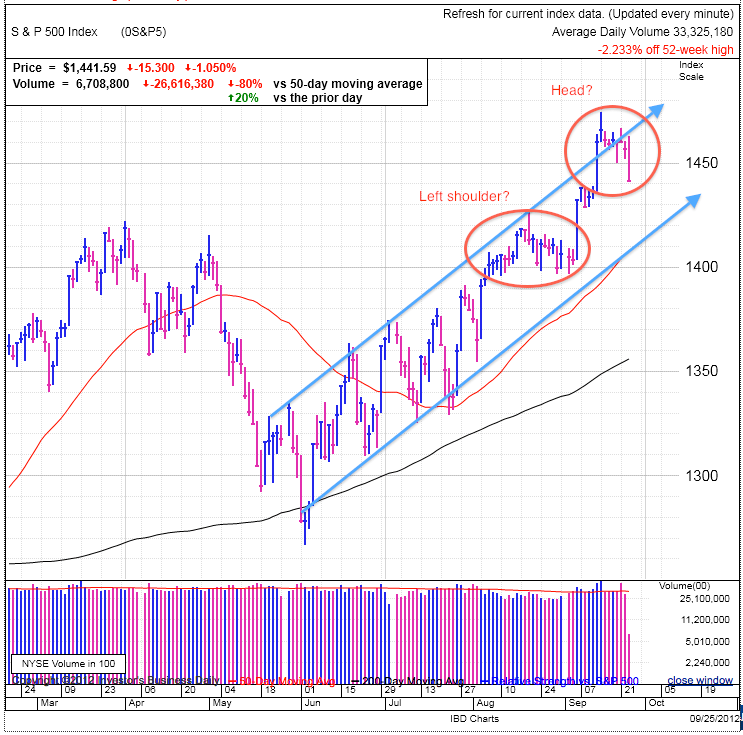 As seen in the accompanying chart, the market continues to trade comfortably inside the previous uptrend channel established this summer. We broke above it briefly with recent Bernanke pop, but have clearly retreated back within the range. It is too early to write the rally’s obituary, but the warning signs are mounting. It sure feels like the market is trying to selloff, but each time big money comes in and props it up. The million-dollar question now becomes, what is ‘smart’ money doing? Is it accumulating shares at each dip? Or is it quietly selling to the ‘dumb’ money chasing these new highs? People think price and volume magically give clues on this, but the truth is the market is always perfectly symmetrical because for every seller you need a willing buyer. What ultimately determines the direction of the market is the depth of available buyers and sellers at a particular level. Will we run out of buyers at this level first, or sellers? Up to this point, the supply of sellers has run short and is why prices have been bid up to four-year highs. But this is a big move since the June lows and the higher we go, the harder it becomes to find new buyers. I still sense there is slightly more skepticism than optimism in the markets, and as we all know, people trade their portfolio according to their opinions. The skeptics are light the market and the optimists are heavy the market. While this balance was far more skewed a few weeks ago and lead to the explosive upside we’ve seen, the scales have become more balanced recently and this is why the bears are finally able to exert more downward pressure on the markets today. Lacking a strong sentiment skew, the market could break either way, but more often the market tends to overdo a trend before reversing and so far it doesn’t seem like this rally has been overdone from a sentiment point of view. But the probabilities are becoming more balanced and there is less of an edge to being long than there was a few weeks ago. An interesting idea came from a WSJ article on Monday quoting several money managers who are allegedly thinking of closing their books at these levels and coasting through the 4th quarter. But here is the thing, big money managers are notoriously secretive in positioning of their portfolio because they don’t want anyone to front-run their trades, so why would these guys start gushing to a reporter about what they are about to trade? It doesn’t make any sense unless 1) they have already sold and closed their books for the year or 2) they are intentionally trying to spook the market so they can buy in at lower levels. Either way, this sentiment by several money managers shows greed has not overtaken the market and big money remains cautious and reluctant up here. 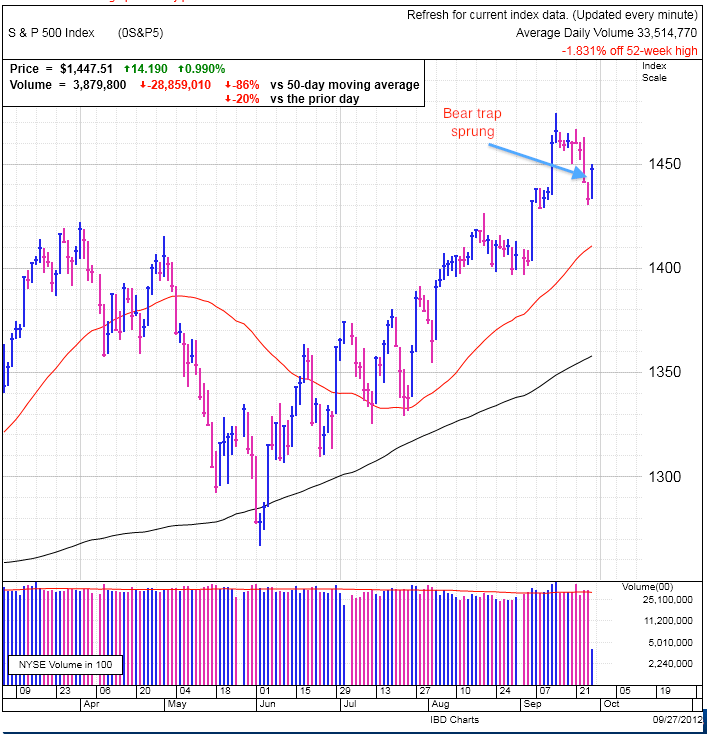 No doubt the market could fall under its own weight if buyers fail to show up, but the fair number of skeptics remaining provides ample fuel for a continued move higher if a rising market forces them to start chasing. The direction is a tough call here because of the recent run up, but I suspect there is more upside left in this move even if that includes a modest pullback to flush out all the weak holders who bought at the tail lend of the recent run-up. Remember, the market is never easy, so buying after the obvious rally was a mistake and most likely so is shorting the obvious start of the correction. I have little doubt the market will chew up both bears and bulls before this is all said and done, so wait a bit before jumping in on either side, unless of course your portfolio enjoys the feel of the market’s meat grinder. As I’ve been saying every day for the last couple weeks, keep doing what is working, but don’t get greedy and be prepared to take your worthwhile profits off the table. It is far more profitable to sell into strength and buy weakness than the other way around. Sell when you don’t want to sell and buy when you don’t want to buy. That is the fundamental core of the contrarian trading. Markets are down modestly, but support is holding up. Continue holding for the time being, but if you are not in the market, don’t come rushing in now because we are closer to the end of this rally than the start. The media and many traders are debating the upcoming election, but how the market reacts might surprise you. Another red day in the markets, but we are still holding above 1450. This level has provided solid support and remains an encouraging sign. Most often buying dries up quickly following unsustainable rallies. Holding this level for more than a week shows real support and a continuation from here is more likely than a reversal. The pattern of modest and controlled pullbacks is continuing and time will tell if this consolidation is building yet another launching pad for the next surge higher. To date the market is largely ignoring bad news and giddy over modestly good news. Don’t fight the tape when the market is clearly inclined to go higher. Now this rally can’t go on forever and we are in the later innings, but so far the sellers are impotent to drive the market lower, meaning the high probability trade remains to the upside. Only after all the bears and cynics have given up do we need to start worrying about a pullback. A couple of key psychological mile markers on the horizon are the end of the third quarter on Friday and the election in just over a month. I addressed Q3 in Friday’s post if you are interested. The election is the next monumental thing after a few regular data points like the employment report in two weeks. Conventional wisdom says a Republican win would be better for the economy and stock market, but the truth is the market is politically agnostic. We’ve had phenomenal rallies under Democrats and crushing bear markets under Republicans, so it isn’t as simple as claiming one side is better than another. The truth is all the market really craves is a stable business environment where it knows what all the rules are. Uncertainty is the real demon that kills rallies because investors fear the worst when presented with ambiguity. The pre-election poling is competitive, as is the case for most presidential elections, but I have yet to see a single poll giving Romney the edge and everything so far shows this is Obama’s election to lose. And no doubt the market is already pricing in an Obama win since the market is always looking ahead. But what will surprise most people is how a market expecting a Democrat win is rallying. While Obama’s taxes and regulation are anti-business, at least everyone knows what the rules of the game are. Romney is promising to “repeal and replace” healthcare and financial regulation, meaning all those bitter, partisan debates from the last couple years will be coming back under a Romney win. And to further muddy the waters, Romney is promising to fire Bernanke, making the future of US monetary policy another wildcard. Many will try to argue with me on this, but the market’s attitude is indisputable. Clearly the markets are rallying into what looks to be an Obama reelection. And if you need more proof, look at the reaction to the Supreme Court upholding Obamacare. What was a crushing blow for the small-government, low-regulation, low-taxes movement has been a boon for the stock market as we are up 10% since the June 28th ruling. The stock market preferred the certainty of Obamacare over the uncertainty of reopening the health care debate. The key to making money in the markets isn’t thinking about what it should do, but understanding what it does. In this case, the market clearly favors status quo over “repeal and replace”. The rally is consolidating, but all good things must eventually come to an end. We probably have more upside left, but are closer to the end than the beginning of this run. Be ready and willing to take worthwhile profits and wait for the next buying opportunity. This isn’t about making all the money, just the highest probability money. It is a fool’s game to try to pick the top, so never regret selling early. Take your profits and move on. It is what the most successful traders do and is what we should do. Bulls make money, bears make money, but pigs get slaughtered. 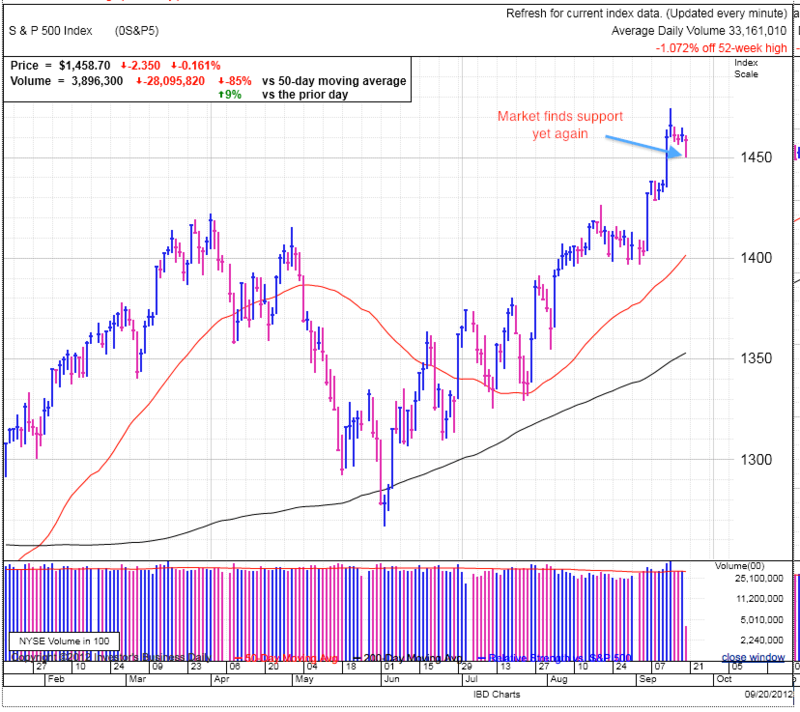 Indexes supported yesterday’s rebound. The key isn’t if we are up or down a quarter percent, but if there are sufficient buyers to hold current levels and fewer profit-takers pressuring prices. 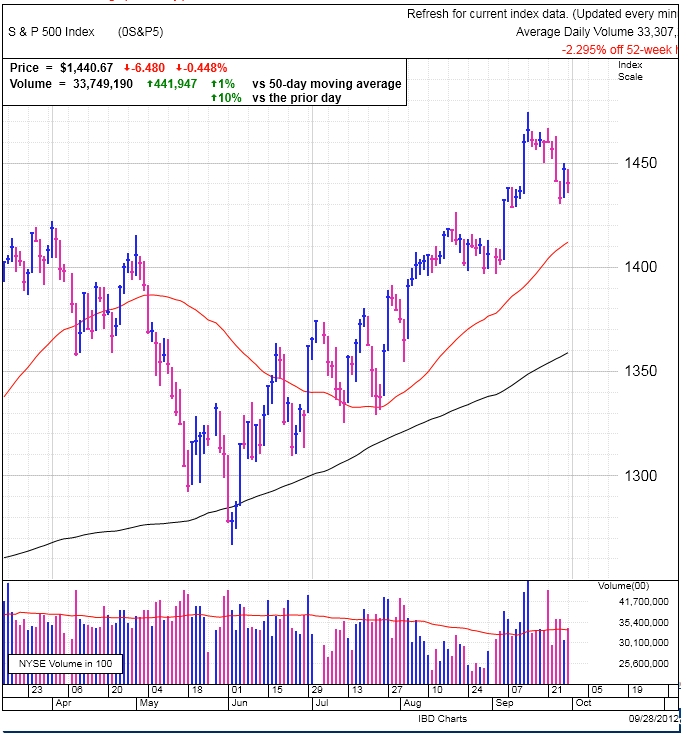 Consolidations have been more modest in recent months and that trend is continuing here. A change in market character is coming because this one is getting a bit stale. We need to be on the lookout because often the market changes personalities with each new quarter, something to be aware of with the current quarter ending next week. I expect the market will transition to either a more consistent grind higher, or alternately a selloff. Grind higher seems more likely due to all the investors underweight this market, but if fear of being left behind doesn’t kick in with the reluctant crowd, buying will dry up and we’ll head lower. This current balance between buyers and sellers is quite bullish given how many traders are fearful of these new heights. With most stock owners demonstrating a willingness to hold, the pressure remains on those watching from the outside. We are approaching the quarter’s end, which is important because fund managers are judged almost exclusively by their performance. Given how many are trailing their benchmarks, we will most likely see buying continue through next week as they attempt to spin their portfolio in the best possible light. Right now that means buying what is hot so they don’t look like the fool who missed the rally when their books are opened up to investors. Of course the thing to be careful of is this big push into quarter’s end on climaxes on Friday. After that fund managers’ clocks resets and they have three months left to catch their benchmarks leading into the all-important year-end. The pressure will still be on because annual performance is even more important than quarterly performance, but the three-month window gives them some breathing room. We could see a dip early next quarter, but with so many lagging managers, they will be quick to buy anything at a discount in an attempt to salvage this year. Don’t expect their buying to be rational when their jobs are on the line, and many funds will reach for performance regardless of what it takes. Same as it’s been for a while, keep doing what is working, but be ready to take worthwhile profits of 20 to 25%. We might be in the early stages of secular bull, but there are still pullbacks, corrections, and bear markets in secular bulls. The market is very stingy when giving out money, so always be willing to take the few gifts it is willing to hand out. Wait too long and the market will take everything back and then some. The predicted selloff continues to elude the “experts”. Trading sideways at new highs is constructive and supportive of a move higher. Keep doing what is working and ignore all the cynics who are trying to pull you on to their losing side. Market dipped at the open, touching 1450 before fighting its way back. Every dip this summer was a smart buy and there is no reason to expect this time will be any different. Trends are far more likely to continue than reverse, so the high probability trade remains betting on a continuation. The dips in June and July were dramatic, but recent consolidations have become far more modest. The market cannot go up every day and it often takes time to digest large gains before resuming the trend higher. This is the hallmark of a healthy market setting up the next bull leg. Markets that continue higher without resting are far more prone to climaxing and reversing lower when the euphoric buying exhausts itself. Modest pullbacks are good for shaking the tree and shedding weak holders who bought late. The weakness also tempts aggressive bears to plunge in on the short side. But as we’ve seen over the last few months, these dips are getting smaller and weaker. With each failed breakdown, a portion of the crowd expecting a big move lower defects to the long side and the bearish camp has less influence the further along we get. The key to successful trading is recognizing a change in market behavior and sentiment early. It is okay, even expected, to be wrong, but it is suicidal to stay wrong. Bearish sentiment continues among the most stubborn, but many pessimistic traders are giving up their compelling fundamental and technical analysis and changing sides for no other reason than the market is steamrolling them. If you can’t beat ‘em, join ‘em. Fighting the tape is bad for your portfolio, sanity, and even health. Too bad for many it takes a while to realize this and the most stubborn of the bunch will finally change sides, just as the market peaks and heads lower, adding insult to injury. Always strive for nimbleness and shun stubbornness. There is no guarantee this dip will bounce, but success is managing probabilities, not predicting the future. No doubt every successful rebound brings us one step closer to the dip that doesn’t bounce, but the smart money and risk management technique is to collect high probability profits and use those to offset the occasional low probability surprise. A consolidation here would let some recent breakouts in individual stocks return to proper buy points, allowing anyone who missed the early part of this rally to get in at lower risk points. Chasing is a dangerous game and those who have the patience to wait for valid entries will face far fewer nerve-wrecking whips in their portfolio. Success in the markets is a numbers game; wait for the odds to be in your favor before putting any of your hard-earned capital at risk. 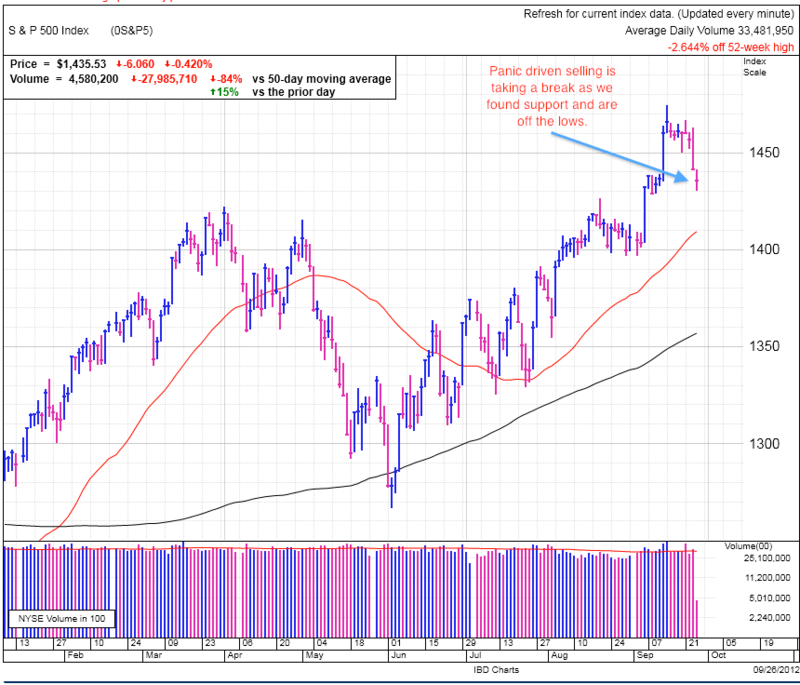 Stocks hold the 1460 level for the 4th day, showing solid support for this price level. Most selloffs after an unsustainable rally happen quickly and dramatically in the day or two following. That is not happening here and the market is building a foundation for another move higher. Any masochists still shorting the market are going to get smacked around again. 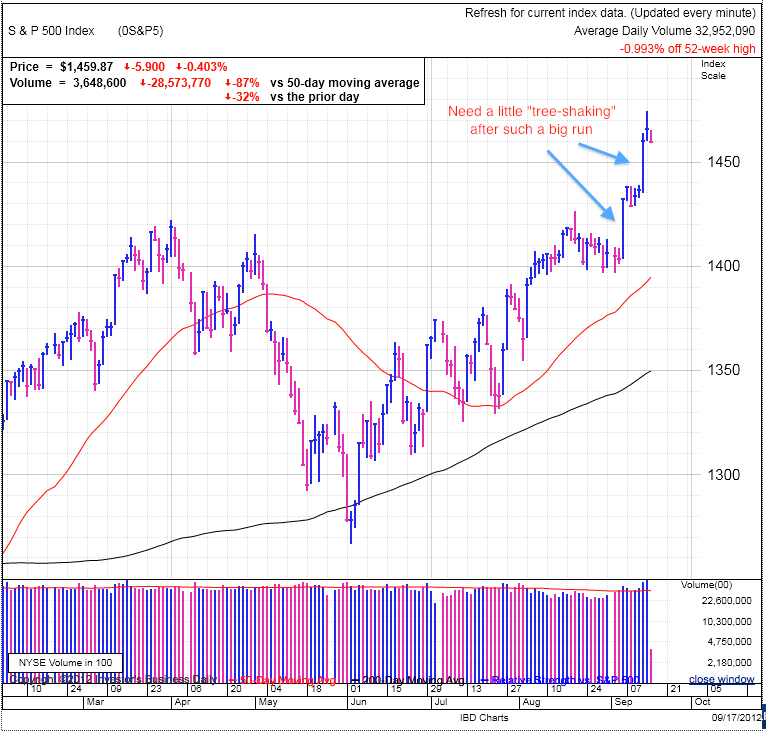 Indexes are treading water around 1460. The anticipated mass exodus has yet to appear and the price-action is supportive of these levels in spite of all the “experts” predicting a move lower. Looking back at previous selloffs this summer, they started quickly and decisively after marking a new high. This pause at 1460 shows buying is not drying up and selling isn’t flooding the market. Bears still think the market should head lower, but they have been burned several times and are becoming more reluctant to stick their neck out and fight this rally. Some bears are beginning to question their resolve and are finally warming up to the bull side. But this shift in sentiment is just starting and has a way to go before it gets overdone. The recent short covering and increasing reluctant to fight the tape means the spring is less compressed. Upside short-squeezes won’t be nearly as pronounced or dramatic as we’ve experienced over the last few months. Most of the fast money on the upside has already been made and we are transiting to a grind higher mode. Former bears and reluctant buyers will start dribbling into the markets and buying every dip, putting a solid floor under the market. From a supply and demand point of view, this new buying and decreased selling is the recipe for a move higher. We’re not there yet, but the rally will get to a point where it is so slow and steady traders become complacent. And that of course is the foundation necessary for a reversal lower, but that is still a ways out and we’ll cross that bridge when we get there. It is getting harder to find new breakouts as most of the strongest stocks already made their move and are becoming extended. The most powerful stocks tend to make their move early in a rally and late breakouts often don’t perform as well. If you find yourself underinvested, don’t chase, wait for a pullback to the 50dma and buy the high volume bounce. Being smart about your buy and don’t be the sucker left holding the bag when the party ends by. Money is made by buying right. If you missed this, don’t fret; there will always be future profit opportunities. The one thing you don’t want to do is put yourself in a precarious situation by chasing stocks because while there will always be future profit opportunities, losses are forever. Another tight trading day in the markets. Technically a down-day, but such a small move is hard to flag as material. Active trade around Thursday’s close is supportive of that new price level, even if it includes a modest slide back to 1450. Stay long what is working, but harvest worthwhile profits because the sun can’t shine forever. 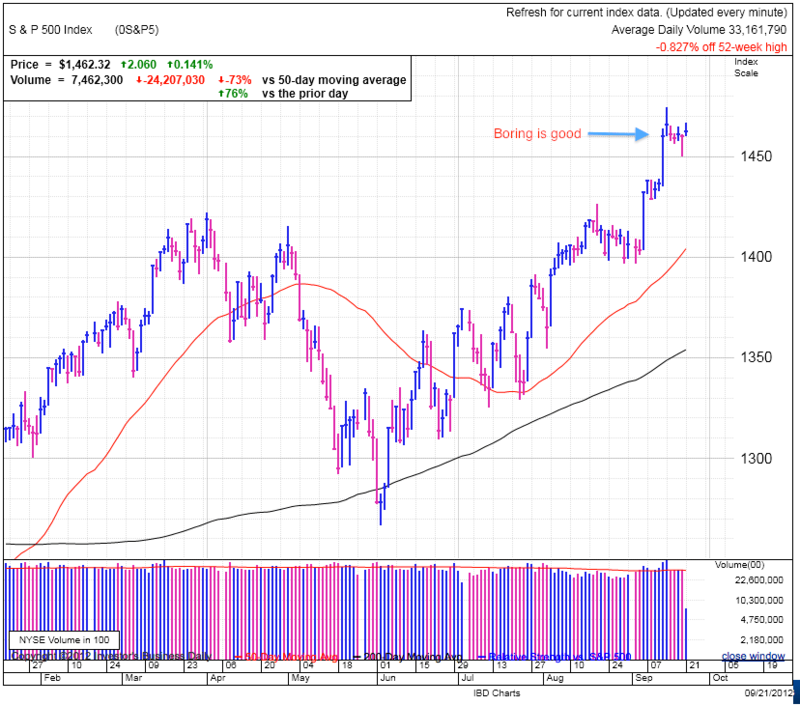 The indexes are off modestly for the second day on average volume. This is constructive price action. We avoided a waterfall selloff and at the same time are not rising unsustainably in a climax. The important thing to note is current holders are not rushing for the exits. 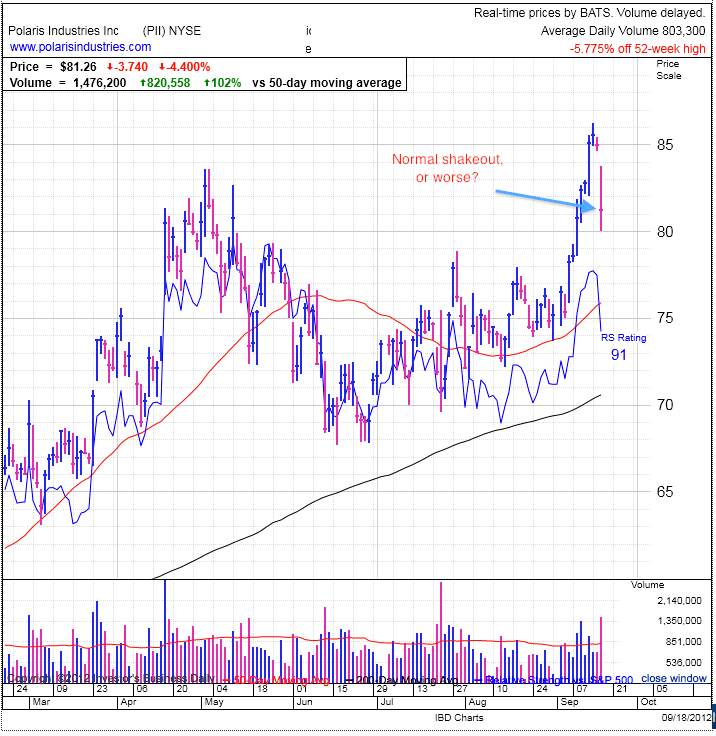 They feel comfortable owning stocks at these levels and explains why selling volume is light and we are finding support. On the other side, those left out of this rally are desperately hoping for a pullback to let them back in at more attractive levels. They are reluctant to buy up here after missing the opportunity at lower levels and this foot-dragging accounts for the lighter buying volume. But these latecomers can’t wait forever and a rising market will eventually force them to bite the bullet. We’ll see when these reluctants start coming around in numbers because stocks will rise in a slow and steady uptrend as their buying prevents any type of pullback. When evaluating supply and demand dynamics, combined with market sentiment, there were a lot of investors reluctant to own this market with all the headline risk and seeing short interest at five-year highs backs up this pervasive bearish theme. But when viewed through the lens of supply and demand, this bearishness represented a large pool of available buyers. And further, since so many investors were already out of the market, or short, that meant there were fewer available sellers remaining to push the market lower. Large pool of potential buyers and small pool of available sellers; seems kind of obvious why the market rallied strongly these last couple months. Traders and journalists want to assign a fundamental or technical reason to this rally, and no doubt the news played a role, but never forget, news doesn’t drive markets, traders do. When the supply and demand became as skewed as it was recently, it made a move in one direction far more likely than. Think of it like a compressed spring. It takes a lot of additional energy to further compress the spring, but it will uncoil by itself the first chance it gets. And that is why the markets could pop 50 points over a couple of days. The market wanted to go up and so it did. I don’t think the spring is uncompressed yet, but with each surge higher we get closer to that point. And of course the market won’t stop at zero as it almost always overshoots. We need to watch for the point where the market is extended and thus prone for a pullback. Up, down, up down. That’s how the market works and getting in tune with these moves makes it far easier to make and keep profits. 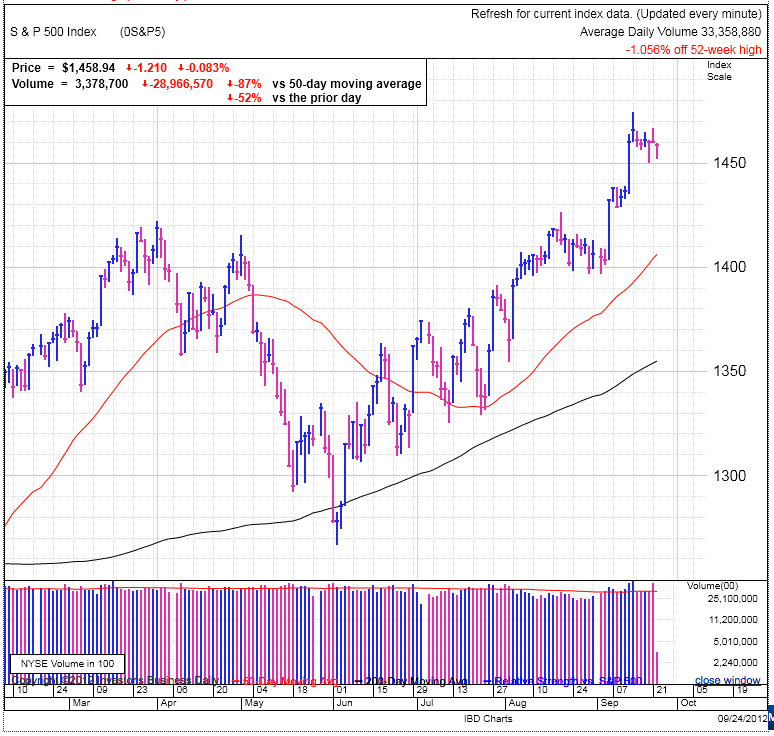 The trend since early August has been large gains followed by consolidation, before making another strong move higher. So far the modest selloff following Thursday’s gains is consistent with this pattern. The swing trade has been the wrong trade the last two-months and there are few sings it is the right trade today. We could easily see a modest slide to 1450 as the market shakes out latecomers, but so far the violent moves lower are not a part of this market’s personality. No doubt this will change at some point, just not yet. Keep doing what is working, which is buy and hold. Let those profits bloom while the sun is shining because this calm won’t last forever. But don’t take this too far by letting your fruit over-ripen and rot on the vine. We’re in this to make money, not hold stocks. LULU and PII are having rough days. Both are still above their 50dma, but experiencing weakness after strong run-ups. There is no way to know which pullbacks are normal and which are fatal. Duration, gains, and popularity will give you a clue to how much of a run could be left, but these are just guidelines and not rules. It is easy to make money in the markets, the challenge is keeping it. The indexes are consolidating after the recent 50point move; a normal, healthy, expected, and bullish behavior after such a big run. No reason to sell and certainly not a good idea to short the rally. The trend is our friend……..for the time being. AAPL is riding high after record iPhone5 sales, but is the company falling behind its peers as other phone manufacturers are leading innovation? Stocks paused after Friday’s new 4-year high. While giving Friday’s gains, the market is still sitting above Thursday’s “Bernanke pop”. This is expected and supportive behavior given the 50point move over the last two-weeks. This is noteworthy bullish action finding support at these levels in spite of the obvious selling pressure from profit taking and shorts doubling down. The key to figuring out where we are headed is getting into the mind of traders, especially big money managers. We’ve had a big move since the summer’s low of 1266. This rally has caught a lot of money managers off guard because the headlines and sentiment remain quite bearish. But clearly the price-action indicates selling climaxed in early June. All the sellers sold at that point and there was nowhere to go but up, and that is exactly what we’ve done. Most watched in disbelief as we rallied, always anticipating the crash that never happened. And now these traders are faced with a crisis of confidence and conviction, finding themselves clearly on the wrong side of the market. We are not measured by the soundness of our ideas, bu the profits in our accounts. 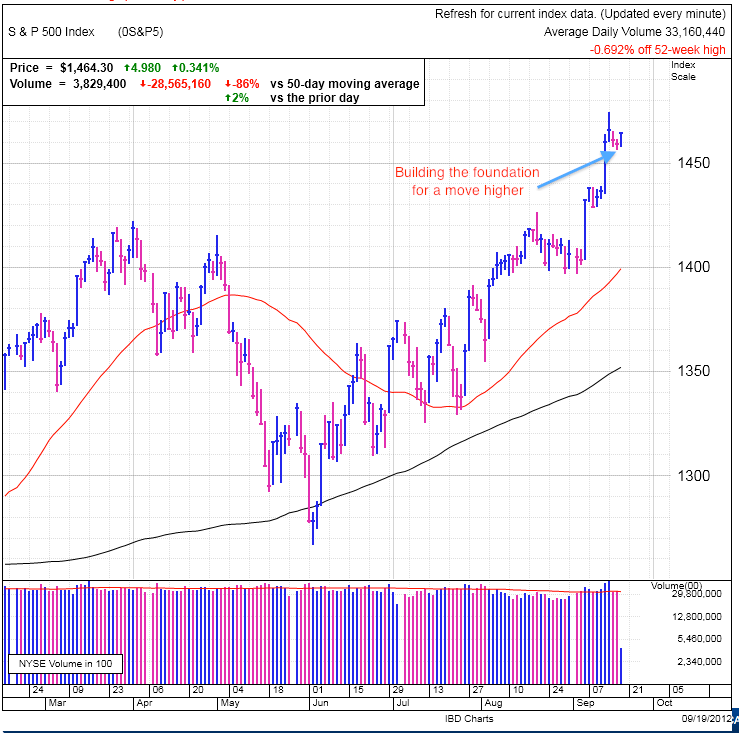 The market is showing no indication it will crash and is in fact accelerating its climb higher with far fewer pullbacks giving late-chasers few opportunities to buy in. No doubt the QE3 pop was a “come-to-Jesus” moment for many reluctant money managers. I expect this was the breaking point for many as they finally realized they could no longer wait for the pullback and now have to start getting their portfolio in gear or else significantly underperform the indexes. To catchup, they need to chase high-beta stocks, meaning many of those speculative sectors will start outperforming after lagging large-cap, blue-chip stocks for most of the summer. Getting ahead of big money is where us little fish make most of our money. And of course in its usual cruel fashion, as soon as these money managers are finally positioned on the long-side, the market will run out of buyers and nose over. The market is a cruel, cruel beast for anyone trading behind the curve. If you want to make money at this game, you need to get ahead of the tend, not chase it. 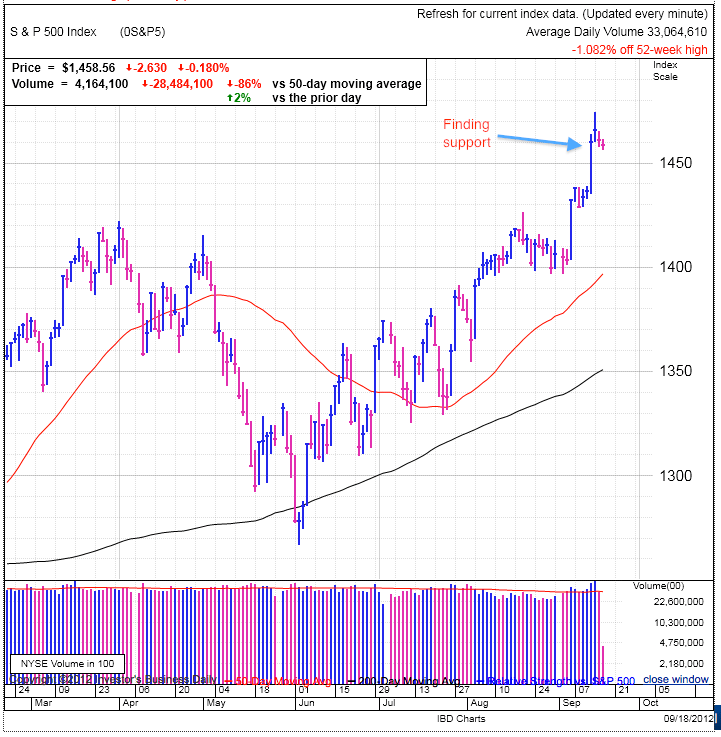 Indexes are finding support at 1460, showing a fair number of people are willing to buy the market at these levels and few traders are anxious enough to sell here. For most of the summer we traded in a volatile, upward trending channel, but the last material pullback was in July. Almost two months without a volatile pullback shows the market has transitioned into another personality for the time being. We are in the midst of a steady climb higher, but that pattern is getting a bit obvious and proactive traders need to start watching for the next personality of this schizophrenic market to come out. Will that be an acceleration to the upside as big money is forced to chase the market? Or will we finally see that material selloff everyone has called for? Or will we see both of these happen sequentially? I’d put my money on the third option, and in fact I already have. No reason to get less-long after this run-up. The market is finding support and is converting former bears into believers. Ride the wave a bit longer, but stay close to the exits. Continue holding what is working and lock in 20-25% profits when you get them. Most of the time you’ll sell early, but it is foolish to hold out for top dollar. If you have a stock you know better than your spouse, you can take the chance on holding through a base, but that significantly adds to your risk profile. And in most instances these additional risks are not necessary because it is so easy to buy a stock back after stages the next breakout. AAPL is hitting a new high and pushing against the $700 level. There is tons of hype over the iPhone5, but as a technology geek, I am stuck wondering if AAPL is still a leader or if it is finding itself in a lagging position. The iPhone5 lacks any real innovation and is simply playing catchup to other phones from Samsung, HTC, and yes, even Nokia. Larger screens, quad-core processors, and 4G have been the norm in Android phones for a year now. No doubt the iPhone5 will be the most stylish phone out there, but is that enough when Android phones are now leading in innovation? And how about fashion trends and people’s desire to be unique? Does the iPhone still feel cool and special when everyone has one? The saving grace for AAPL is the exploding global middle-class, but I expect competition will put significant pricing pressure on AAPL in coming years and this might not be a buy-and-forget-it investment going forward. 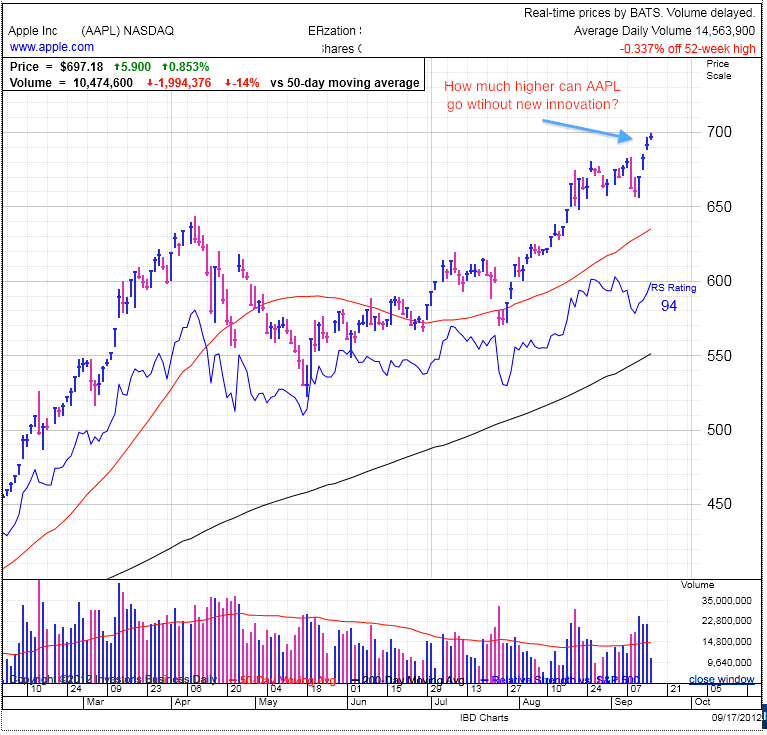 No doubt momentum is behind this stock and it could continue higher in the near-term, but from a technology and innovation point of view, Apple is falling behind its peers. Its reputation will carry it for a little longer with consumers, but remember the stock market is forward-looking and the stock price will peak before the fundamentals do.